The last of the V8 Interceptors… for an Uber ride. There’s just something about the look of Mad Max that appeals to me. It’s one of my favorite films. I love the car chases, crazy post-apocalyptic landscape, and the bloody-mindedness of it all. Needless to say, I was very excited for Mad Max: Fury Road, and I made it a point to see it on the big screen and soak it all in. Loved it. Even though I was worried about the lack of Mel Gibson, Tom Hardy was a fine replacement, Charlize Theron was epic, and the whole thing really worked for me. I love my car, but if I could get my hands on a V8 Interceptor, I’d trade it in a heartbeat. I’m not the only one. Uber took corporate tie-ins to the next level, offering free rides in Mad Max-style speed machines for fearless Pacific Northwesterners. Unfortunately, if you’re looking to catch one of these shiny, chrome rides on the Fury Road to Valhalla, you’ll probably miss your chance. 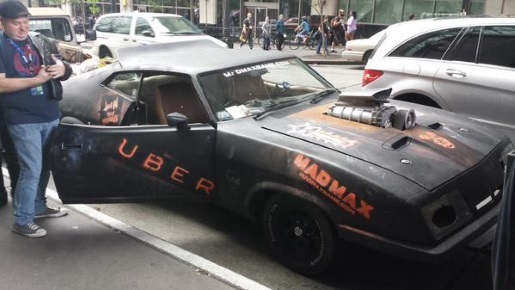 If you’re already in the Seattle, Washington area, you’ll be able to grab a free Mad Max Uber ride tonight. If not, then don’t bother booking a plane ticket, because today is the last day for the promotion designed to raise awareness of the Mad Max video game. The above image was one of four captured by Twitter user @flintmech while attending PAX. Since the promotion is ending, maybe Uber is looking to offload some of these cars for cheap. If so, they can always give me a call. I’ll spray paint in my mouth and race right over there to get my chance at one of those mean machines.